1Put the onions, pepper, ginger, curry leaves, chilies, lemon juice and salt in a pan and squash together. 2Add the potato and tuna and mix into a thick paste-like mixture. 3Cut the eggs in half. 4For each egg half, use the tuna mixture as the other half to mould egg shapes. 5Squeeze well so the tuna half sticks nicely to the egg half. 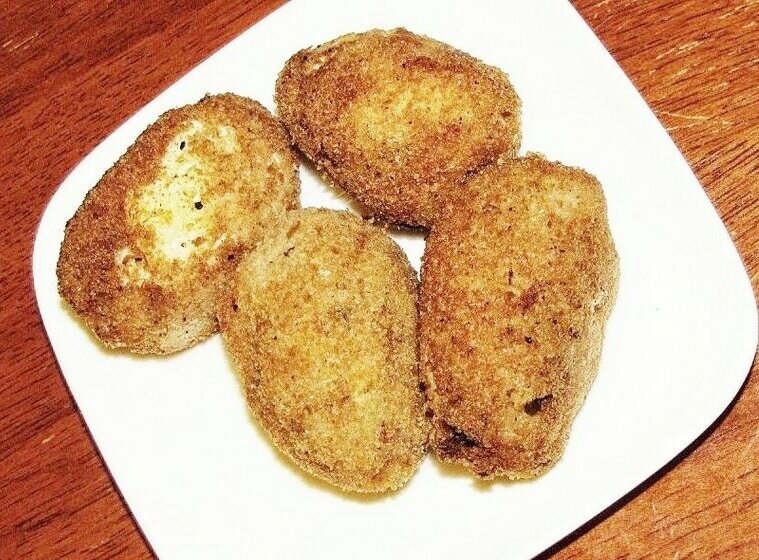 6Dip the molded egg shapes in the beaten eggs and coat them with breadcrumbs. Make sure that they are coated evenly. 7Again, be careful to squeeze them tight as they will pop, spraying hot oil when put into the frying pan if there are air pockets between the egg and tuna halves. 8Deep fry in vegetable oil and drain. 9Tip: Stirring the water in a circular motion while it is boiling will ensure that the yolk remains in the center of the egg.